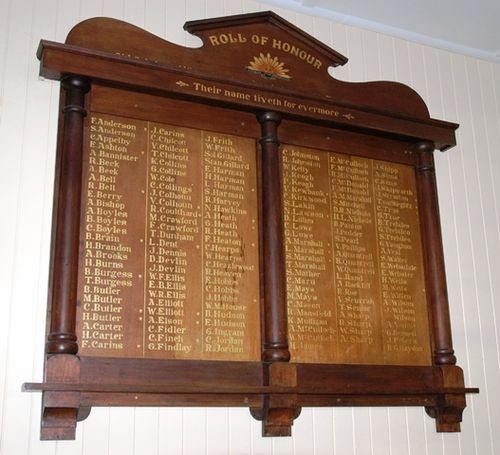 A wooden honour roll commemorates old scholars of the school who served in World War One. At Ulverstone yesterday the school honor roll containing the names of about 170, was unveiled in the presence of a large number of residents, many of them being the parents of the lads whose names were on the roll. The supreme sacrifice was paid by some of the lads. Miss Nellie Hobbs came forward and removed the flag which covered the roll, and Mr. E. Hobbs, M.H.A., read the names of those on the roll, among which was that of his son Jack, an asterisk opposite which showed that he was among the gallant dead. Mr. Hobbs referred to the conference of nations at Washington, expressing a hope that as the result of their deliberations the possibility of war would be removed.